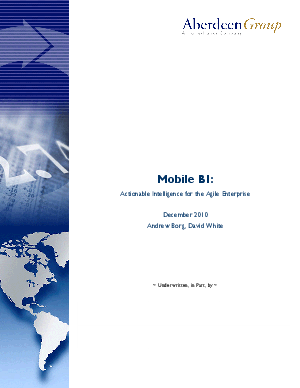 The Aberdeen Group recently conducted some benchmark research examining the intentions, strategies and required actions of more than 140 organizations using mobile business intelligence (BI) throughout their diverse set of industries. By extending the reach and usage of their existing BI infrastructure to mobile devices (through the use of visualization tools such as dashboards, charts and graphs), organizations found they could more agilely respond to market changes and customer needs accelerating time-to-information and improving customer satisfaction. Learn about these results, the emerging best practices for mobile BI usage and the framework by which you can assess your own management capabilities for enterprise mobile BI adoption.